Claire is a Registered Veterinary Nurse who qualified in 1999. Before joining us Claire spent eight years in a busy mixed Practice in rural North Dorset. 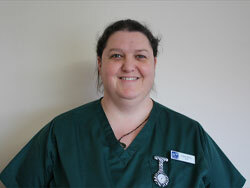 Claire joined the Pet Health Partnership in December 2007 and has an interest in all aspects of veterinary care. In her spare time Claire enjoys riding her horse, walking her dog and seeing friends.